Rene Cantu Jr., executive director of the Latin Chamber of Commerce’s Community Foundation, is now also a Clark County School Board member representing northwest Las Vegas. The School Board chose the 48-year-old Cantu from four applicants who were interviewed Thursday. The District E seat was left vacant when John Cole resigned before moving to Denver. The vote was 5 to 1, with board member Deanna Wright supporting a different candidate, but still “perfectly happy” with Cantu. Cantu will only be on the board until the four-year term ends in five months and voters elect a new representative. Although short in duration, the time is likely to be turbulent. The district is at an impasse with the teachers union over a 2012-13 contract, and cut 1,000 teaching positions in June to cover the cost of continued teacher pay raises, which the Clark County Education Association won in arbitration last year. In the interview, Cantu listed labor relations as one of three top issues facing the district. None of the others did, which is why Cantu stood out to senior board member Carolyn Edwards, who said negotiations with the teachers union and the district’s three other labor unions will be a top priority in coming months. Cantu listed the dropout rate and teaching a diversified student population as the two other top issues. He may understand the issues, but Cantu will have a steep learning curve, having not worked within the Clark County school system as the three other candidates have, Edwards said. Still, Cantu exhibited all the qualities needed, board member Erin Cranor said. He’s in tune with community issues through his foundation and has children in the school system, Cranor said. 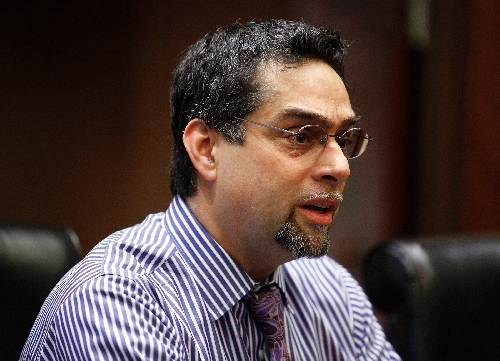 Cantu has a background in education and has been vice president of multi­cultural affairs at Nevada State College and director of retention at the College of Southern Nevada. Although he earned a Ph.D at the University of Texas, his mom didn’t graduate high school and his father earned his high school equivalency in the U.S. Army. “But they knew education was the way forward,” he said.